product and service companies. Starting her career right out of college, she quickly climbed the ladder as Marketing Manager and then as Director of Investor Relations for a publicly traded company. Kim always dreamed of being in the real estate business and recently “made the move”! Kim is devoted to God and her family. She and her husband, John, have six children and have been married for 23 years. During those years, they found a lot of joy and success in fixing and flipping homes. With Kim’s passion and understanding of the current market and John’s art and skill as a craftsman, they were always ready to take on their next project. In her down time, Kim enjoys spending time with her family, reading, playing golf and traveling. She is passionate about constantly learning, growing and improving in every area of her life. 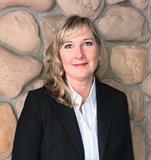 "Kim was very helpful in every aspect of helping us sell our lake place. She is very friendly and was willing to listen to our ideas. Kim would always be on time when showing us properties. I would recommend her to any future clients." "For friendly hands on service, see Jared or Kim, such a pleasure to work with these two, thank you!" "Working with Kim Baker went smooth and she was very understanding with details. Communication was very good and she kept in contact throughout our time with her. I would recommend Kim Baker with helping buying a new home anytime." "Bought a cabin. Process went pretty smoothly and quick except closing day! But Kim stuck with us the entire time and helped us take care of the issues. She has even followed up with us after the transaction to make sure everything was going okay for us." "I wasn't really looking for a realtor yet because we were just starting to think about buying a cabin but Kim contacted me and was not pushy at all. She would check in with me every once in awhile and when I found a place on Zillow that I wanted to look at I called her and she showed it to me. We recently closed on the property and are very happy with the whole process and Kim's service!" "Kim helped us from step one. She answered any questions we had and got back to us very quickly anytime we needed her. Stayed with us during closing when some issues arose. Recommend her services!" "Excellent open communication, did not feel pressured during sale of our property due to "lender" issues that delayed closing, she is calm, professional and consistent to get the deal done ASAP."